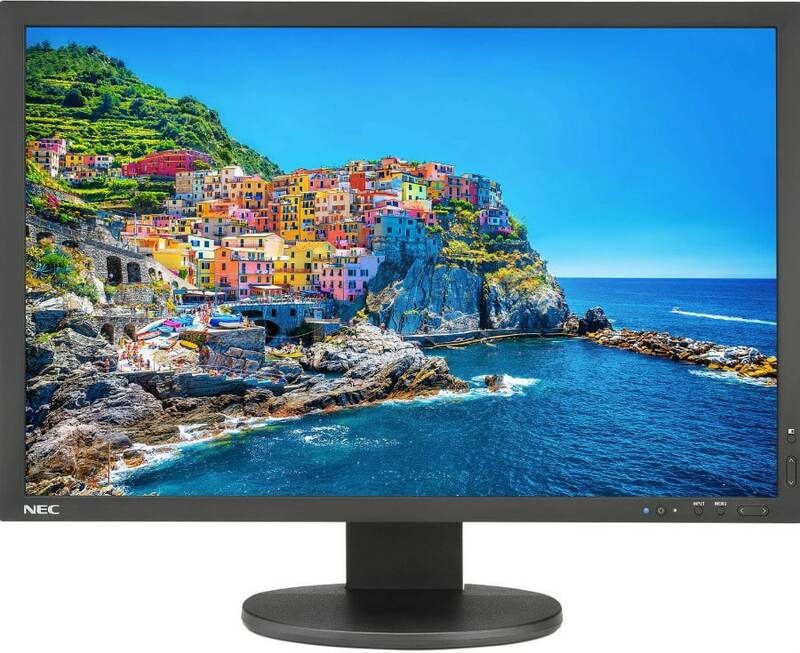 The NEC PA243W sports the now rare 1920 x 1200 resolution and combines it with comprehensive gamut coverages for industry-standard imaging performance. This monitor isn’t at the bleeding edge, but it offers important specs which high-level content creators and editors will appreciate. The NEC PA243W costs almost twice as much as the BenQ SW240, making it interesting to check out the aces up its sleeve. The NEC PA243W sports the simplified and industrial exterior design that most of its brethren use to indicate an all-business appeal. The chassis comes in a smooth to the touch matte black which gives the monitor its clean and subdued appearance. The face includes bezels which are thicker and noticeable than most. However, it still does look reasonable against the screen size. The build quality on the NEC PA243W is top-notch just as how consumers who look at these types of displays can expect. The whole device feels like a tank due to its solidity and weight. However, we recommend carrying it around by the neck rather than the cabinet itself. 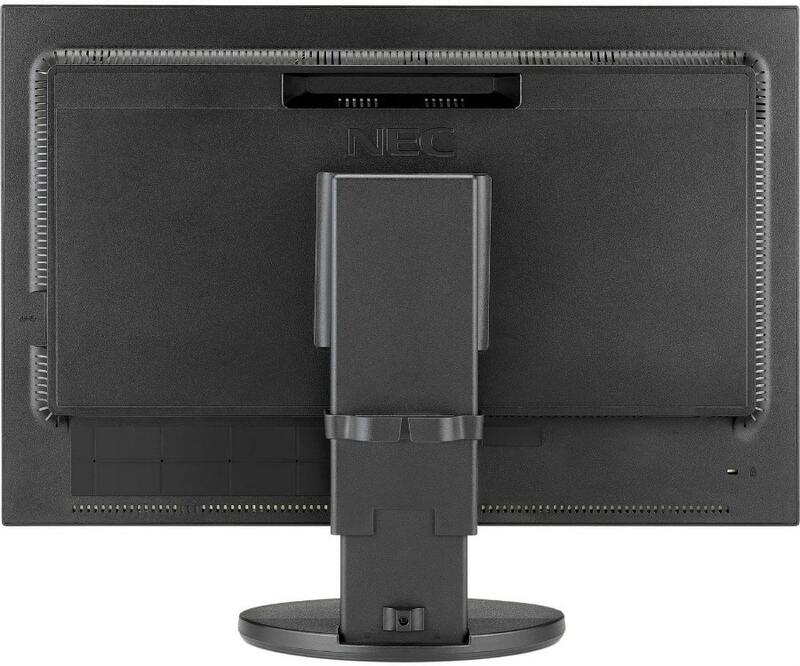 What’s nice about NEC monitors and the NEC PA243W is they all come with fully adjustable stands that are silky smooth to adjust, yet firm enough to hold the display’s position. The mechanism can tilt, swivel, or pivot, plus you can raise the screen through 6 inches of travel. The monitor is VESA compatible, but you have to remove this part to reveal the 100 x 100 bolt pattern on the bulge. The NEC PA243W’s functionalities including its I/O panel is one of the most comprehensive we’ve seen. The layout pretty much includes every video input you can think of such as DisplayPort 1.2, HDMI 1.4, DVI, and VGA. There are also five USB 3.1 receptacles for accessories, but a USB-C port is sorely missing from this professional display. The NEC PA243W features a 24-inch AH-IPS panel with a 1920 x 1200 (16:10) resolution, 60Hz refresh rate, and 8ms response time. The screen is backed by a 350cd/m2 lighting unit which provides a more lenient range of adjustment for calibration junkies. This model is aimed at photography or design professionals more than gamers, so it’s flagship features lean towards wide gamuts and imaging fidelity. The gorgeous IPS display on the NEC PA243W can put out 10-bit color, plus it is supported by a 14-bit 3D LUT for excellent calibration accuracy. It’s also worth noting that the DisplayPort and HDMI slots can receive 10-bit signals as well to ensure that the colors are at their peak qualities. This model also has factory-calibrated modes than cover 99.8% Adobe RGB, 96.5% DCI-P3, and 80% Rec 2020. Despite these capabilities, the NEC PA243W isn’t marketed as an HDR monitor, although it posted exciting results when checked with a colorimeter. Out of the box with only brightness adjusted, the screen fell a bit short of the specified gamuts with only 95% Adobe RGB and 90% DCI-P3. These scores still aren’t bad since the screen has plenty of saturation; however, there are cheaper products that can perfect the Adobe RGB gamut at least. But the NEC PA243W’s jaw-dropping out of the box accuracy will easily help you forget a few percent of color missing. This model posted DeltaE scores lower than 0.9 for both DCI-P3 and Adobe RGB, with sRGB trailing a bit at DeltaE 1.1. Contrast is equally superb at 1080:1, whereas some professional displays struggle even to reach 900:1. Panel uniformity for the NEC PA243W isn’t as good as we hoped for since there is a maximum deviance of DeltaE 2.1 from the center. This is not a deal breaker by any means since users will fail to notice the difference most of the time, plus you can alleviate it with the included UC mode. Once activated, the color error drops to 0.9 from the center, but the screen will take a noticeable hit to the contrast ratio. Take note that uniformity results will vary from unit to unit despite NEC’s outstanding quality control and reliability. If you get a unit which does not present massively visible differences, we recommend leaving the UC function turned off. We also did not notice any backlight bleeding on the device we checked out, but then again, bleeding issues also vary from each device. The NEC PA243W isn’t a gaming monitor, so its no surprise that its spec sheet is transparent when it comes to pixel response time. There were noticeable blurs and smudges during our PUBG test, so we cannot recommend this device to avid gamers. There is also no Adaptive Sync solution or at least a low input lag mode included with the NEC PA243W’s OSD. When compared to a gamer-specific model, there was a slight delay between our inputs and the screen, although it shouldn’t be as noticeable for casual gamers. The NEC PA243W posted an input lag score of 25ms which some can live with but is too high for competitive players. The NEC PA243W is an excellent and easy to use professional monitor for editing, content creation, and even color grading. It’s comprehensive gamut missed the advertised scores by a few points, but its fantastic accuracy at default more than makes up for it. NEC’s factory calibration and expertise is something you can expect from their brilliant products. The monitor may look old school while sporting a rare, and mostly unused resolution by today’s standards, but these aspects are what gives this monitor its unique identity. The only jarring thing about the NEC PA243W is its hefty price tag which can buy you a 4K monitor like the Acer PE320QK.